It seems everyone has a first memory of Thornton Wilder’s Our Town. Mine, in typical style is mildly embarrassing and reveals me to be the uncultured swine I so often am. It was my third year in University, which happened to be my ‘Study Abroad’ year. So I find myself in an introduction to theatre class at McGill, with the Professor (you have to call them that there I discovered even if they aren’t a proper Prof like at home) holds up a book (this was 2004, we’re old school) and asked what the famous image was from, a work that was of great importance he said, it changed American theatre he said. So my ‘Out Town’ first encounter story is not a particularly rose-tinted one of discovering this theatrical masterpiece, more mild embarrassment and slinking down in my seat. However, as the Royal Exchange’s programme notes indicate, a formative work for so many theatre makers. Why? probably because it encompasses both parts of theatre making so perfectly- the magic of the theatre with the humanity of the stories we tell. The setting in the round at the Exchange works perfectly and brutally for the exposure of the humanity of it all. Keeping the lights up and engaging with the audience throughout makes it clear that ‘Our Town’ is very much ‘your town’ as an audience. Incidentally the warm welcome and vocal ‘hello’ the Stage Manager gets at the start is possibly very much indicative of this being Manchester not London. It in fact seems the perfect set up for this welcoming of Cities, where the actors spend all of the pre-show period sat chatting with their onstage seated neighbours. It was a delight to play spot the actor but also relish in the easy manner in which people were chatting as they sat on their tables looking like they were indeed coming for a town meeting of some sort. And you have to wonder how much of this working is to do with the Manchester setting- it’s hard to imagine some of London’s stuffier audiences warming to that, but here it works and it feels like something you could drop down in many regional cities and foster this small town in a large town feeling that the setting generates. From the opening monologue then that includes ‘Manchester in 2017’ it already feels like ‘Our town’ is indeed ‘our town’ at this moment. All of this frames the play as a part of where we are now, rather than the historical setting it’s placed in. Stripping it back from the Hallmark-styled productions that Wilder himself hated, we get the bones of the production and with it the characters stripped back to their bare humanity. It’s too easy to strip Wilder’s play back to just a small reflection on the lives of the townsfolk. But that’s not to say it can’t be also enjoyed for that. Indeed, enjoying the early scenes for their humour and charm only serves to strengthen the emotional punch that the play builds to. So why not sit back, enjoy the quirky humour of the townsfolk and the innovative setting and moving of actors and furniture for Act 1? because actually if you let the small town charm wash over like an episode of Gilmore Girls, the punch it packs at the end is all the more powerful. This staging suits it effortlessly, stylised without feeling gimmicky, it moves the story along at a pace and makes the stage come alive with the bustling of the town. And the engagement with the audience works perfectly. The blurring of lines between fiction and the ‘real world’ works beautifully especially when it’s revealed there are yet more actors scattered around that we didn’t know of. (Member of the wonderful Royal Exchange Company of Elders). 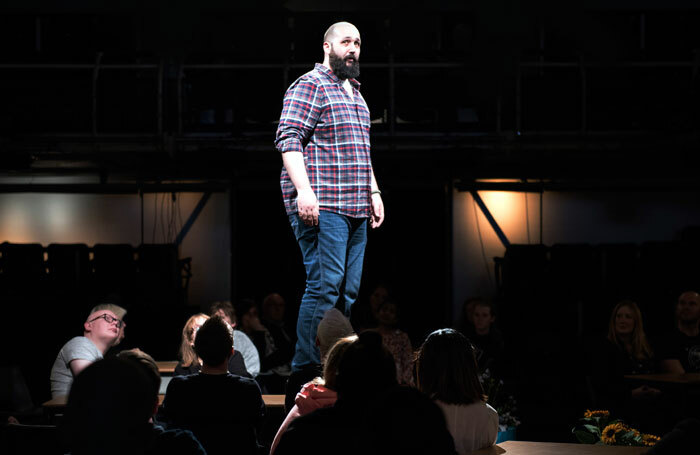 The in-the-round setting of the Exchange lends itself perfectly to this stripped out approach, looking your fellow audience member in eye adds to the community feel and when the Stage Manager asks you to introduce yourself to the person next to you, it feels like fostering that community further. And for me an outsider to this town that it was staged in also felt like being oddly welcomed by the world of the theatre too. The key thing about Our Town is the pace at which it whips by. Wilder’s commentary on life stretched across the play. No sooner are we settled into a scene than it’s stopped, moved on to a next one. Time is narrated and years lost in a line. Characters we think we will like are glimpsed but hardly seen again. The moments it feels like it slows enough to catch breath are moments of music in the church with that repeated refrain of ‘Blest be the tie that binds’. 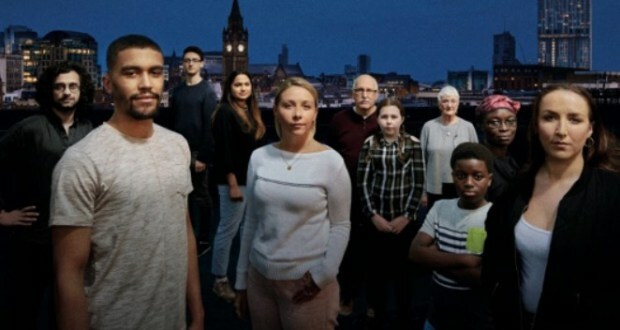 Punctuating the play and sung each night at the interval by a guest choir, it is a moment of pause and a refrain to pull the town and the audience into focus, and it’s done beautifully here building towards the final heartbreaking rendition. The church choir also reveals one of this production’s hidden gems- the incorporation of BSL and a D/deaf actor into the show. I’d actually spotted Nadia Nadarajah chatting outside in BSL so it wasn’t a surprise when she joined in with the chorus of singing in her own language, but it was a beautiful moment of theatre. 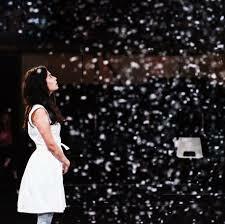 To see a performer fully incorporated on a leading theatre’s main stage using BSL, her character still the same as written by Wilder with the exception of how she communicates, proving that this shouldn’t be a barrier to performers or audiences. 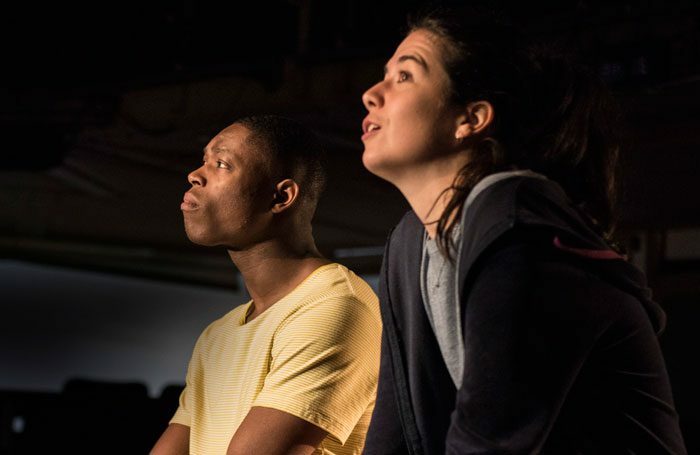 Sarah Frankom makes this an inclusive performance seamlessly- some of what she says is ‘translated’ through repetition by the other actors, but other elements are left in BSL alone, and the audience understands, both the words and her character. Anyone who says that we can’t make inclusive performance should look at this. Most importantly, artistically Nadarjah’s use of BSL is integral to showing ‘Our Town’ as full of the kind of ‘real’ people that would populate it. Having a D/deaf character using BSL is a part of representing diversity as colour blind casting, or having wheelchair users on stage. It’s an element of who they are but doesn’t define their character, and in a play like Our Town that is all about the people who make up our town and our world, it’s a natural addition to the text. There is a warmth and sadness to the story of the young lovers. On one hand we feel for their young love, as with a rom-com we will them together. But also we’re aware of their youth and wasted opportunity as their young marriage approaches. We feel the regret of the older characters, of lives lost, but are also won over by the charms of their young love. Of course as with life, it’s the final act that will break your heart. The weight of life catches up with everyone in the town. And the question of death looms in the air. As with the rest of the production it’s subtly and beautifully executed and the half-lit auditorium gives the audience nowhere to hide. As the play draws to a close there’s a stunning moment of theatricality that in the stripped down backdrop is stunning and well earned. Wilder’s words alone will move you to tears but the visual picture Frankcom has been building to is enchantingly overwhelming and moving. And while there is a moment of feeling like your heart is being ripped out and that things may never be quite right, the production gives you back a sense of hope to close. A sense that you can go and reclaim what the characters might have lost- that appreciation of the moment, and it invites you to do it in your town.